ardes mechi creates and maintains trademarks, works out advertising and marketing campaigns to originate the desirable changes in consumer behaviour and attitudes. 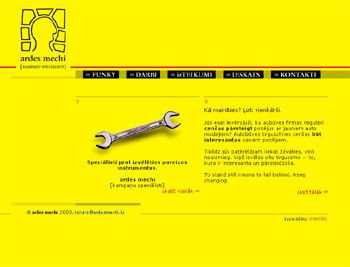 The Internet society mendo has developed a website for ardes mechi according to its corporate style, identity, and philosophy. The design of the website can be characterised as minimalist. 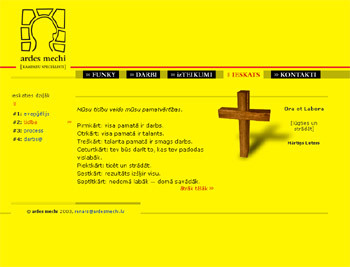 Users get attracted by the interplay between the company’s logotype and red and yellow colours. 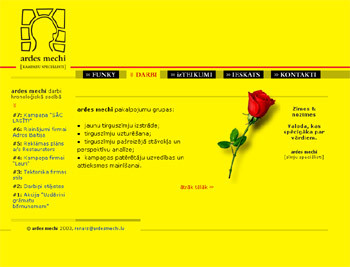 Even though at the beginning yellow on black was the hallmark of ardes mechi corporate style, mendo managed to persuade the company that a thin red line would breathe more joy and vital power into the site. By now the thin red line has been integrated into the overall corporate style of ardes mechi. The main aim of the site is to inform the visitors about ardes mechi. The start page has been designed so as to allow easy updating, publishing of fascinating pictures and texts. The core texts of the website are brief; they are supplemented with eyecatching quotations and impressive pictures symbolically related to the meaning or implied sense of the respective quotation.